When I was doing my research on DIY home renewable energy, I came across Tomas Haynes’ Energy2Green e-book. Its main web site is at www.energy2green.com. Personally, I quite like the web site design and color scheme. I think the little character looks a lot like Albert Einstein. Energy2Green is the only home energy guide that has been seen on TV channels such as ABC, NBC, FOX, CNN, Discovery Channel and PBS. None of the other guide has such accolade. When you read the copy on Energy2Green web site, it has a pretty interesting twist to it. It turns out, Tomas’s guide started off as an engineering project for a university. 1) Work within a budget of under $500. 2) Construct a working solar panel and windmill with everyday building material. 3) The design must be simple so an “average Joe” can understand. 4) Combat global warming at the micro level. When they finally came up with a winning design, it was put to the test by high school students. High school students actually made their own solar and wind power system by following the step by step instruction in Energy2Green. Pretty awesome! Tomas Haynes promised on his web site, anyone that follows his guide will be able to reduce their home electricity bill up to 80 percent! That depends on your current home electricity consumption and how many electrical devices you have. If you are willing to get rid of power hungry devices such air-conditioner, water heater, microwave, refrigerator etc, it is possible to reach that goal. A home solar or wind power system can easily be scaled up to produce more energy. When you have more electricity than you need for your daily consumption, you can now sell the excess back to the power utility company! So what’s my verdict on Tomas Haynes Energy2Green manual? It is very informative and helpful if you are planning to make your own home renewable energy system to reduce your electricity bills. If a bunch of high school students can follow the instructions and made their own solar panel and wind turbine, I’m sure you can too. 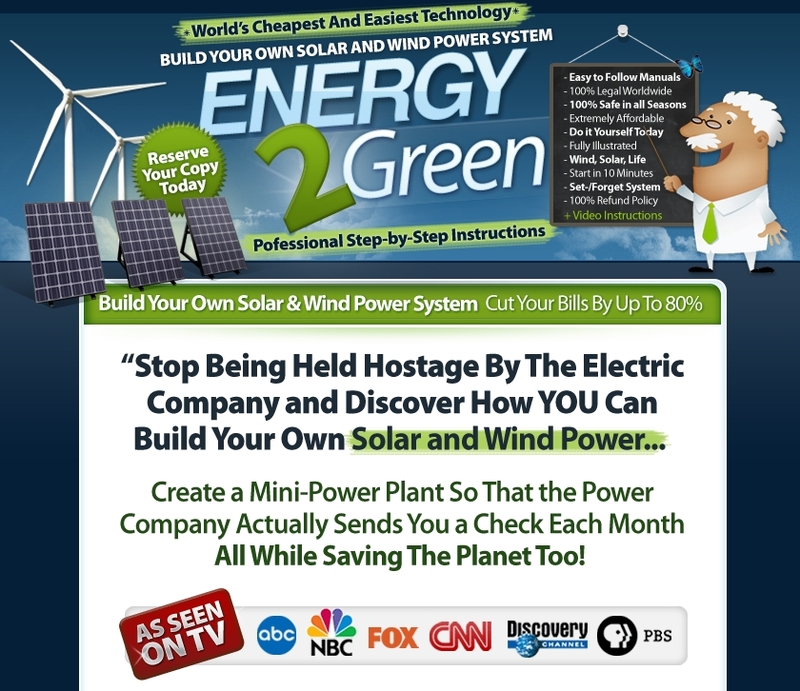 ==> Click here for Energy2Green instant access!